Four Democrats who hope to be on the November ballot in the 8th Congressional District gathered at Minnesota Public Radio's Duluth studio for a debate Friday morning. The 8th is one of two open-seat congressional races this election cycle. Republicans consider the seat, now held by departing Democrat Rick Nolan, one of their best possibilities to flip from Democratic to GOP control this fall. 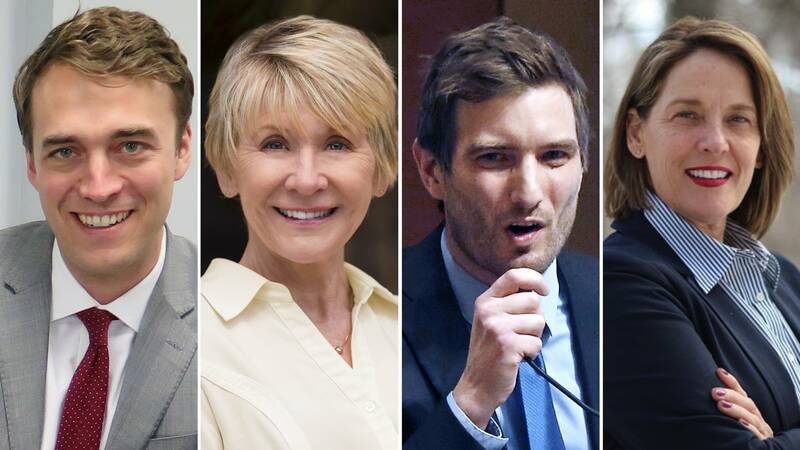 The top four DFLers competing in the primary are two-term North Branch Mayor Kirsten Kennedy; former Duluth TV news anchor Michelle Lee; three-term state Rep. Jason Metsa, and former state Rep. Joe Radinovich, who most recently ran Jacob Frey's successful campaign for Minneapolis mayor and served briefly as his chief of staff. "I am a single mom who's had to pick herself up and put life back together," Kennedy said. "I've known loss, I've known everything. I've worked two jobs." "I have a secret weapon," Lee said. "I am not a politician. I'm a journalist, I know how to gather facts. I know how to listen and I will go to Washington and speak truth to power." "I know what it takes to get things done," Metsa said. "I've been in the Legislature for the last six years. We've passed some very bold initiatives." "This race is about pitching a big vision about where we're going as a society," Radinovich said. "I think a changing economy is a problem we face. I'm going to tackle that head-on. That's why I think I'm the best." On the big issues, Lee distinguished herself from the pack as the only one who opposes proposed new copper-nickel mining on the Iron Range. "I cannot support copper-nickel sulfide mining," she said. "This type of mining has never been done in a water-rich environment without harm to the people or the environment itself. There's too much at stake." The candidates also talked about an item in the news right now: the hiring, by U.S. Rep. Nolan's reelection campaign in 2016, of a man who left his congressional staff amid allegations of sexual harassment. Radinovich ran that campaign, and said he fired the staffer as soon as he became aware of his background. None of the three other candidates took issue with Radinovich over the matter. Asked what their most important issues were, Metsa, who's proposing a Medicare-for-all system, said he's been hearing a lot about health care concerns as he travels the vast 8th District. "A woman from Walker, for example, said that she couldn't get the medication she needed because she had her insurance company sent a letter saying that her coverage was denied, no explanation, no option for appeal," Metsa said. "There was another young woman I met over in Baxter who said that people were rationing insulin because they couldn't afford their medication." Lee said she would push to bring high-speed Internet to all of the district. "Our grandparents did it back in the 1930s with the rural electrification act," she said, "and they brought electricity to every corner of the rural areas of this country." Radinovich talked about addressing the evolving job market. "I think that the forces of technology, mechanization, globalization and the rapid changes that they are producing in our communities are the most important issue facing us," Radinovich said. Kennedy spoke of reworking the way the national government spends tax dollars. "We need to restructure our economy and actually rebuild our middle class," she said. "I would argue we don't have a middle class right now." All four of the Democrats expressed concern over trade wars. Some of them noted that the Obama administration imposed punishing tariffs on Chinese steel manufacturers believed to be in violation of trade agreements. That more precise approach, they suggested, is a better way of handling trade disputes than are the sweeping tariffs President Trump has been imposing. Trump was popular in the 8th District and won there two years ago by more than 15 percentage points. All four Democrats expressed a willingness to work with Trump on anything that would improve conditions for 8th District residents. But Metsa accused Trump of breaking promises he made to district voters. "He talked about prioritizing the American worker, and instead we've been seeing our executive branch bailing out Chinese telecom giants and sending jobs down to Mexico," Metsa said. "What we really need to focus on is putting people first again." Whoever wins the August DFL primary is expected to face Republican Peter Stauber in the November election. Stauber, a former police officer, is a St. Louis County commissioner. He said that regardless of which DFler he's up against, his message will be the same — government is too big and too instrusive. "Let the economic engine in the 8th District prosper," Stauber said. "We have to reduce the redundant, overburdensome regulations that are stifling economic development." Stauber will know exactly who his DFL opponent will be after the Aug. 14 primary. Soren Sorensen is also running in the DFL primary. To listen to the debate, click the audio player above.